«House of Night and Day» unfolds in barely a hundred years ahead. The world is divided into enclaves where one has to be wealthy in order to gain entry. All others live outside the enclaves in a world of chaos, violence, crime and poverty. One of them is Marko Eldfell. For five years he has been on the run from the supreme "masks", having deserted from the NATO special forces after a military operation in Georgia. He, together with a small selection of soldiers, is injected with a genetic modification that makes him able to activate special features when needed- the body´s own drugs; adrenalin, dopamine, serotonine. Characteristics that makes him stronger, faster, more vigilant and able to act more rationally under pressure. Not super powers, but "super drugged" with the body's own hormones and properties. All controlled through a sort of built-in data application called the iSphere. This property is part of a human militarily experiment that Marko and his group in NATO force was part of. The problem is that every time he uses his additional powers, he lits up like a red rocket on «The Mask ́s» radar. It is in other words a constant and persistent quest for Marko throughout the book. Through confrontations with Albanian mafia, Marko and his alcoholic doctor friend Lenny find themselves in a situation they can not get out of without help. And assistance comes in shape of a mysterious man with a bowler hat, whom pick them out of their troubles inexplicably. "House Between Night and Day" is a science fiction/thriller; first in a trilogy. A pure Norwegian science fiction blockbuster of international caliber. Finally!! «This is SO great! I’m half way through and didn’t even look up until five hours had passed. «The House between night and day» feels like when I first saw Bladerunner or Johnny Mnemonic. Gritty, futuristic sci-fi, with street wars and underground groups. Genuine chills. 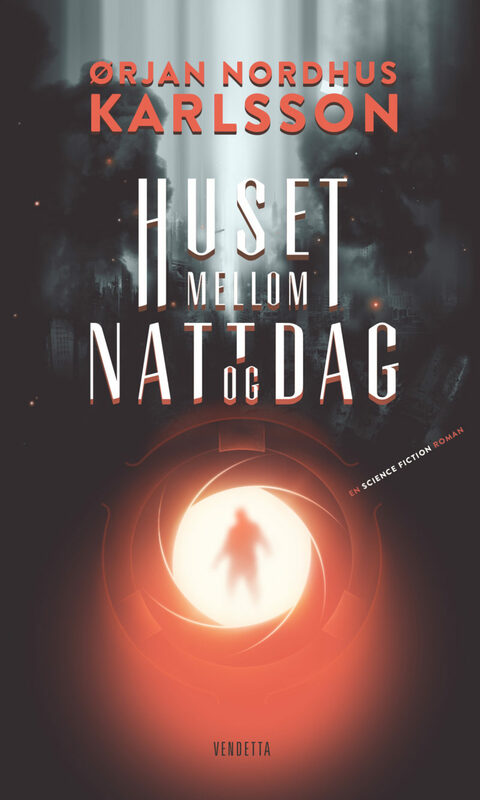 (…)"
Karlsson succeed in creating a well written story about the crucial for a science fiction novel; a credible and exciting tale about something that never existed! I ́ve had a wonderful experience traveling around the world with Marko Eldfell; and I am REALLY looking forward to the next chapter in this sci fi adventure! I was caughts into this book from the first page. Marko Eldfell is an interesting and warm character with his secrets and a consciousness (...) Can´t wait for the second book! !